Today’s snowfall looks like it could actually amount to something. The trees toppled by hurricane Sandy, lying every which way on the ground, might create some interesting sculptures. Mr. and Mrs Cardinal are wisely loading up at the bird feeder. If the flakes keep falling, it might be a while before the feeder filler (otherwise known as Mike) gets back out there. So, what’s a girl to do as she hunkers down for some serious indoor time? Why, start looking through photos of days filled with sun and fun. And, having just seen several of my Villa Buddies over Christmas –Diane, Karen, Denise, Emily, Wayne and Sandy– (We missed you, Greg and Sally! ), I decided to take a trip down Memory Lane, all the way back to July, by reliving one of our day trips. 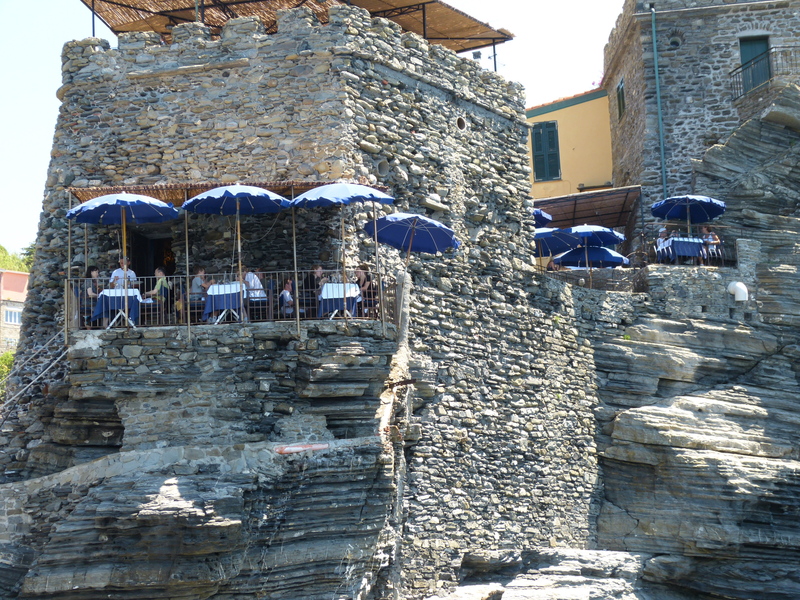 We had heard so much about Cinque Terra, we decided to venture forth from our villa to explore a couple of the five seaside villages. The Lucca tourist office offers a series of regularly scheduled day trips, however the Cinque Terra trip wasn’t scheduled for the day we wanted. Instead, the tourist office helped us find a far better alternative: a private tour. 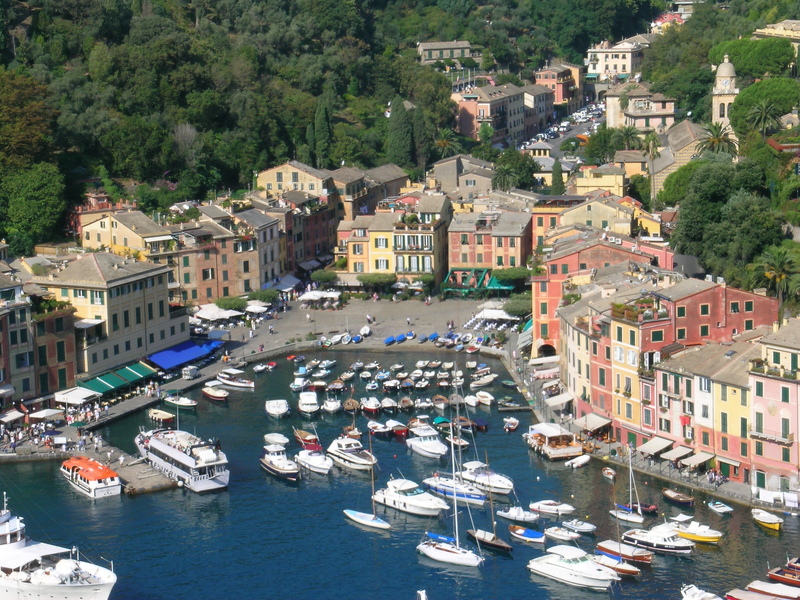 Our driver, Wolfgang, picked us up at our villa, drove us to the ferry in Portovenere, got us our ferry tickets and an itinerary, then met us at the end of the day in Monterrosso, to return us to the villa. Of course, we COULD have managed this on our own, but that would have meant driving in two separate cars, figuring out parking, the ferry schedule, taking a round trip ferry ride–nothing tremendously difficult, but the driving had fallen to the one person willing to brave the Italian roads, and it was time to give Diane a break. 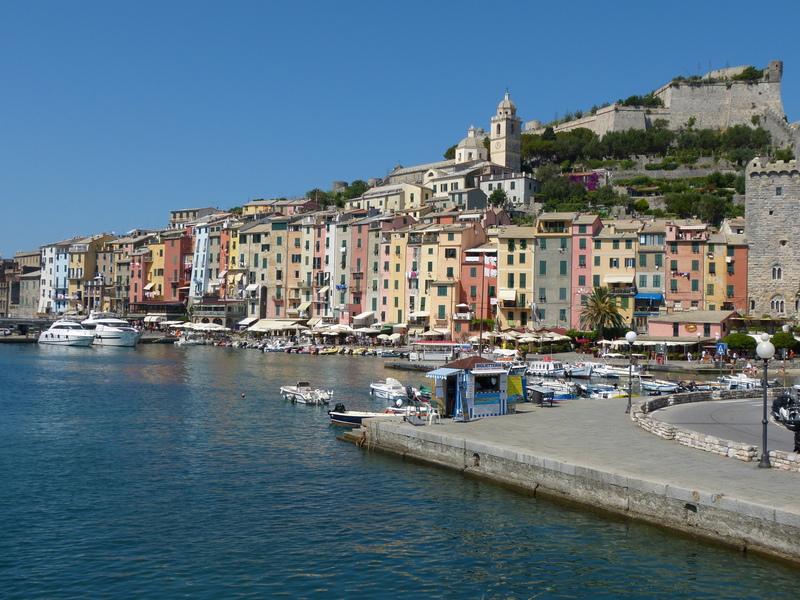 We drove through La Spezia, the cruise ship port for those cruisers bound for Cinque Terra, on our way to Porto Venere, a cute little seaside town. We had just enough time for a cappuccino and pastry before boarding the ferry. It was the perfect ferry ride: warm, with a cool breeze, clear skies, with spectacular views along the way. We could see the cultivated fields stretching up the side of the mountains. I wouldn’t want to have to plant and weed THOSE gardens! As you can see, stone was quite plentiful, and incorporated into the seaside buildings. Why is it that even laundry looks picturesque in Italy? There was only time for a quick stroll up into the town, (and I do mean UP), then it was time to board the next ferry for our last stop, Monterrosso. We were told there is a hiking trail between the villages, but given that we were now in our lazy phase of the trip, decided to take the easy method of transportation. The trip UP into town may have helped us make that decision. This village had an actual beach, with umbrellas and chairs for rent. I, however, was more interested in this lovely alcoholic version of iced coffee. I got all of the benefits of the beach, without sand in my seat, or sunburned shoulders. 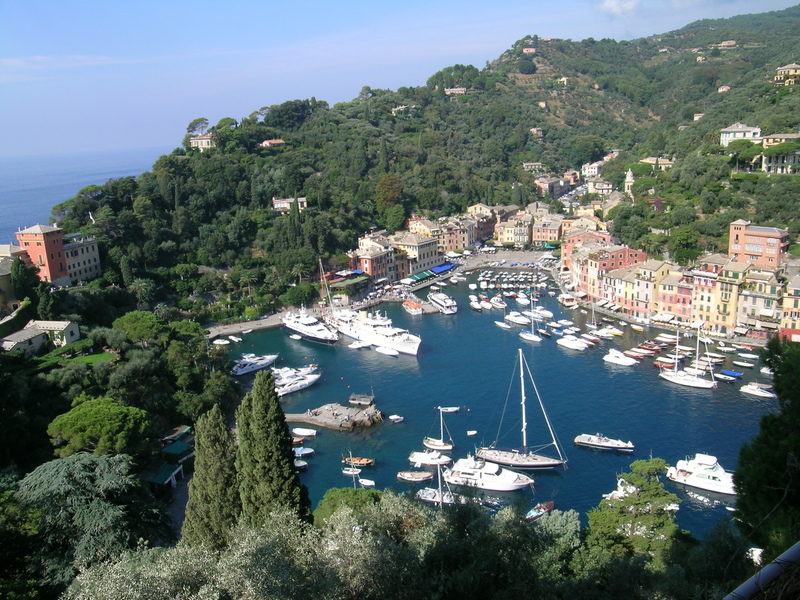 And since today is a day for looking through photos, I decided to include a couple from a trip Mike and I had taken in 2004 to Portofino, another seaside village further up the coast. 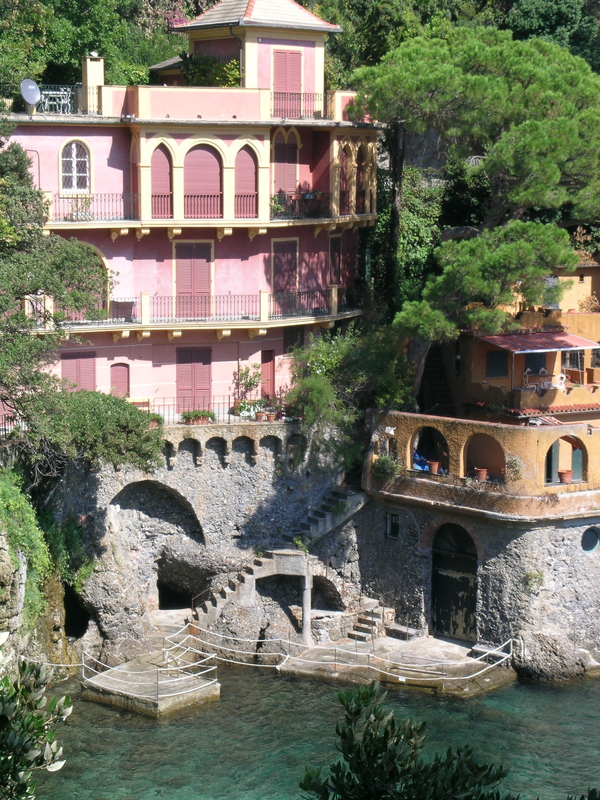 Like Cinque Terra, the houses were sherbet colored, built tightly together. It too was lovely, and for THAT trip, we actually DID stroll along the hillside trail. Take a look. Although it lacked a beach, there was plenty to see on that day trip. Ah, Italy– something tells me I’ll be back! I love the Cinque Terre so thanks for that wonderful reminder. I would challenge anyone to visit Italy only once in their lifetime, there’s something about it that just sticks with you and demands to be repeated! Thanks, Olivia. So nice to hear from you. I hope you had a wonderful holiday, and I’m looking forward to “joining” you on your travels in 2014. Thanks Lin/ Only 30 days till the next adventure! 4. I can’t find anything on the monks i say no. monks are considered lazy and fat – is that considered a good merit for the family – not in this culture – i don’t think theirs either. 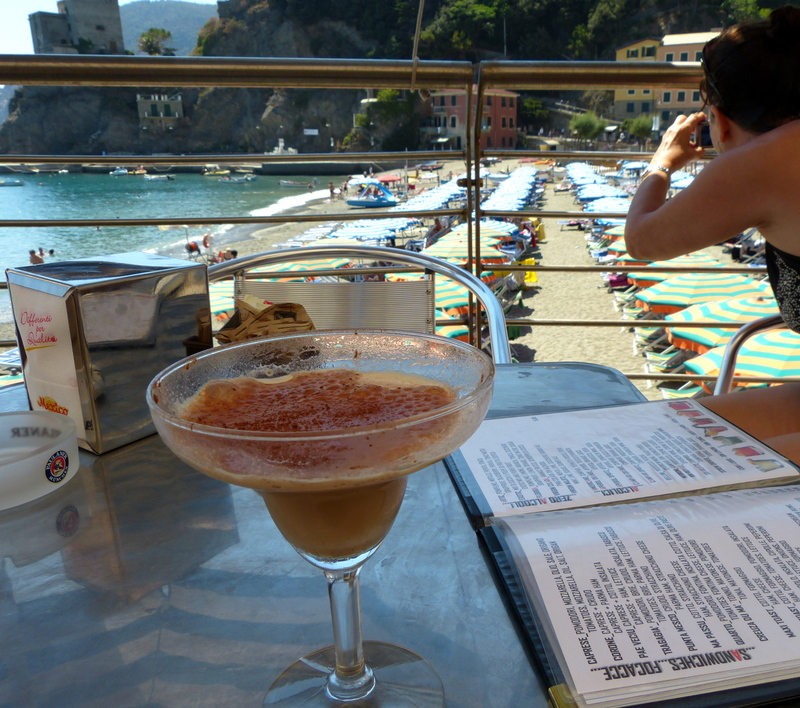 Your photos brought back such wonderful memories of my time in Cinque Terre! I loved the villages. We trekked all over and it was lovely hiking through steep vineyards and scented lemon groves… you must go back!! There is also a train line that runs through all five villages, so you can train it instead of taking the ferry next time too. 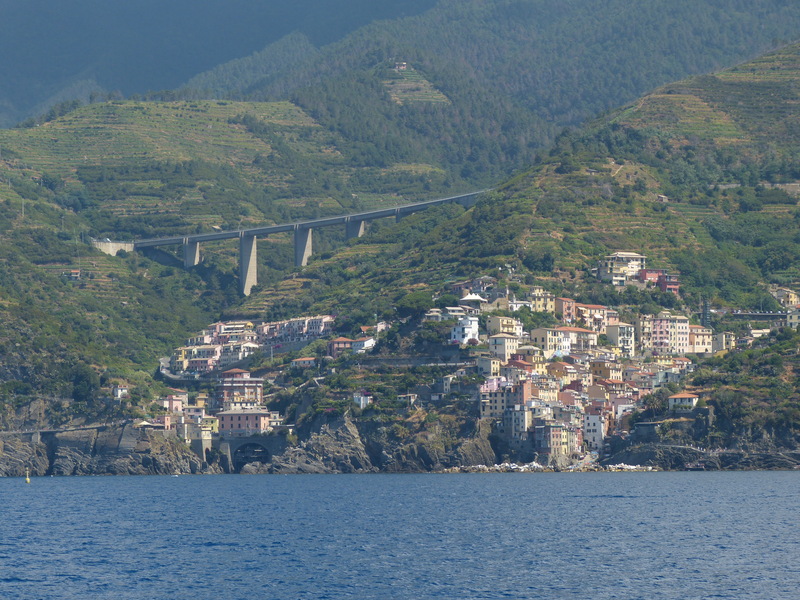 My favourite village was definitely Manarola – picture postcard perfect!